Ten Ravnica guilds will be officially live in Magic: The Gathering when the new Ravnica Allegiance set sees the light of the day on January 25, 2019. This time it’s all about five guilds: Azorius (white-blue), Rakdos (black-red), Gruul (red-green), Simic (green-blue), and Orzhov (white-black). Each guild offers a new game mechanic, which provides players of Limited formats with clear build-around gameplans, such as: Addendum, Spectacle, Riot, Afterlife, and Adapt. 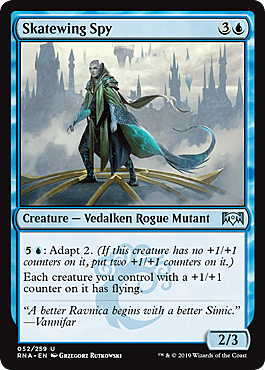 The latter one clearly has the chance to shine in this meta, which makes Simic color pair especially strong. But if you want to know more about each of the best Ravnica Allegiance cards for Limited format, then check out our selection right here. A common 2/3 flier for three mana is an excellent deal no matter how you look at it. On top of that, it has Adapt ability, which can allow this creature to grow in size in case you have no good way to spend four extra mana during your turn. If you happen to have more than one copy of Aeromunculus in your deck, then it’s going to guarantee sustainable attacks in the air during the early parts of the match-up. And quite often, that’s all you really need to win. 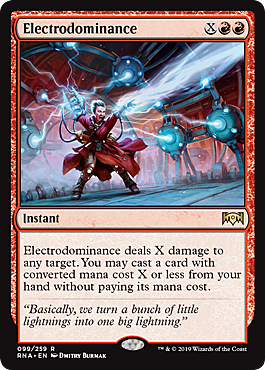 Wizards of the Coast find various ways of introducing the Lightning Bolt mechanics in almost every set they release. 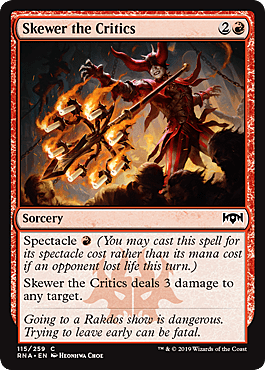 Skewer the Critics is Ravnica Allegiance’s Bolt, although at sorcery speed only. Whether you need to get rid of some pesky creature or simply finish the game by bolting your opponent, Skewer the Critics will do all that. The Spectacle mechanic is not that important in the late game, but somehwere in the second or third turns it can provide the necessary advantage of removing a small blocker. You will probably almost never play this card with a haste option, as it is a much more valuable at 4/4 stats. Then, on turn 6 it can really get growing using the additional ability of +3 attack. Usually, it can trade for slightly larger blockers, and not blocking wouldn’t be an option at 7 points of attack. So in any case, Frenzied Arynx should just attack and not worry about anything. This is definitely the type of card that will puzzle many opponents of yours. Stabilizer and looter in one card. It just shows how pushed Azorius guild is in Ravnica Allegiance. The looting ability is especially exciting and it’s really cheap at only one blue mana. Quite often you will have extra lands in your hand that you would want to get rid of, and that’s where Senate Guildmage will make your game truly interesting. If you’re running a blue deck, then you most likely want to add one or two counterspells for good measure. But how about a counterspell and a creature all in one package? 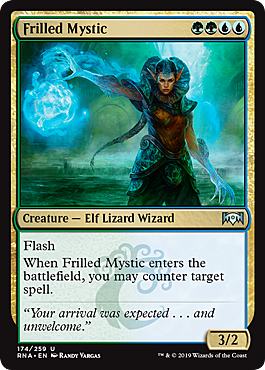 The stats on the Frilled Mystic are really great even without the counter ability, but with that on top it quickly becomes the premium uncommon in Limited. Note that it counters every spell regardless of its type, which is almost unbelievable. If you’ve got one of these in your deck, it will create a lot of surprising looks. A creature with double Shock ability is something every red player always wanted. Although this isn’t purely a red card, it’s still one of the most potent cards in the set. This isn’t exactly a build-around card, but if you happen to run red and black, then be sure to include this one into the rotation. 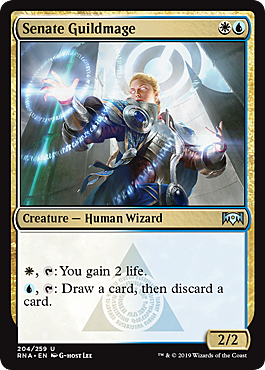 Draft players will especially have fun playing this card, as it will stand just right against the Senate Guildmage, which simply must be killed as soon as possible. What a terrific card name! 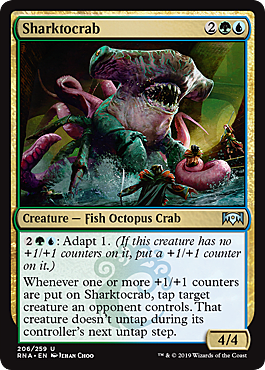 But in all seriousness, Sharktocrab is a big deal and it’s going to create some trouble in Limited, that’s for sure. Adapt provides here not only the growing stats effect, but also activates the Icy Manipulator ability, which can potentially disable the largest blocking creature for two turns. And if you can find other ways of putting extra counters on Sharktocrab, then the tapping ability will just keep winning you games. This Rogue Mutant becomes increasingly more powerful the larger the number of Adapt creatures you have in your list. It is a clear build-around, but one that pays off incredibly well if done right. 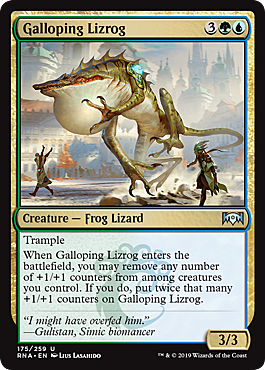 It will fit in Simic or Temur decks that rely on a variety of Adapt creatures that will suddenly gain the ability to fly when this comes on board. With this kind of strategy you can get many surprising wins, but of course, you must work for it to happen. This Sphinx is as straightforward as they get. 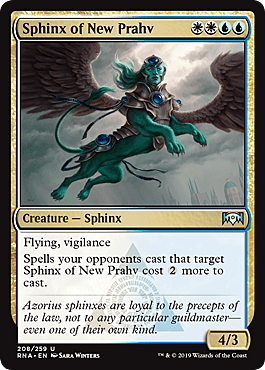 Flying creature with Vigilance for four mana is something we’ve seen several times before. But this one is also half-protected from the opponent’s removal spells. 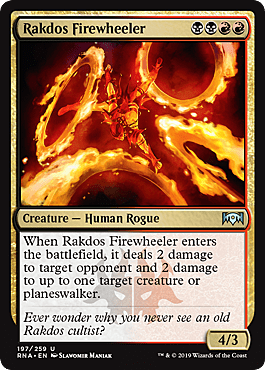 Of course, it doesn’t make it invincible, as in case with Hexproof, but it’s still going to annoy a lot of people. 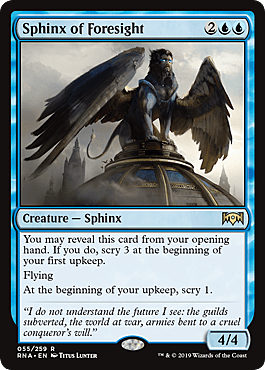 The Sphinx is a great counterpart to an adapted Aeromunculus, but if that Adapt hasn’t been applied yet, then you are free to attack and still preserve the blocking ability. Sunder Shaman is easily one of the most OP uncommons in Ravnica Allegiance. It has a large body and it can’t be blocked by more than one creature, which would be more than enough. 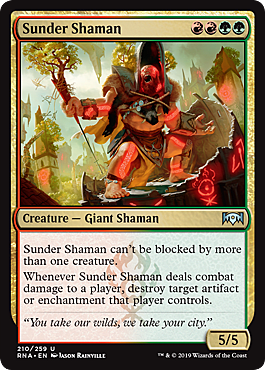 But then comes the part that really turns Sunder Shaman into a must-have card, where it destroys artifacts and enchantments everytime it connects. This is just ridiculously strong and wil hurt many people in both Sealed and Draft. Re-using Adapt is a great feature, and this card allows you to do exactly that. It is another build-around creature that once it comes on the battlefield will make all others look really small. Trollbred Guardian isn’t as effective as Skatewing Spy, but it does give all Adapt creatures Trample, which could play a huge role in certain cases. 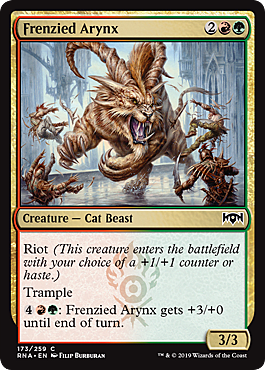 But its biggest upside is the sheer size of this creature, which easily becomes a 7/7 with that Adapt 2 ability. 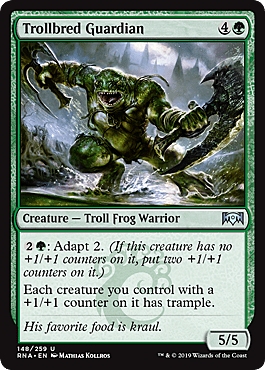 Strangely enough WotC decided not to give this Troll any kind of self-protection, as was the case with many other Trolls in the past. But it looks like the new trends are coming, including Trolls with no defense mechanisms. Flexibility is this card’s main point, as it allows you to both deal damage and cast something from your hand. Whether it’s going to be something big or small depends on your given situation, but in any case Electrodominance will have a lot to offer. Another upside of this spell is the Instant speed, which practically gives Flash to any creature in your hand. This can turn out to be one of the most disgustingly powerful cards in the set. There is a lot of Scrying involved in this one card. But that is exactly what blue decks want: to be able to filter through a large number of cards until you get the right one. This will also keep a lot of opponent fliers on the fence with its 4/4 stats for four mana. And of course, you want to see this in your opening hand for that Scry 3 effect every time. But even if you get it only once, it’s still a big deal. Simic guild has already proven to be really strong in this set with all its Adapt synergies. 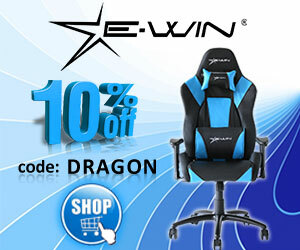 So here’s something to finish your whole game plan with a blast. Zegana is tremendous Adapt card, which not only grows twice in size, but also draws you cards. All this avalanche starts at mere four mana and ends with a significant boost to your side of the table. It looks like Limited is going to be really exciting this time around. I like to play video games and hope to be a great science writer at company that provides services like buy essay for colleges, or being a video game journalist.